UPDATED: Fri., April 7, 2017, 11:06 p.m.
OAKLAND, Calif. – They splashed and twirled their way to their 12th consecutive victory, they’ve all but clinched the No. 1 overall seed in the postseason, and now the Warriors have a next neat little trick. Hey, Kevin Durant, how do you feel about getting back in and joining this? Oh yes, that guy – Durant is slated to return to action in Saturday’s game against New Orleans at Oracle Arena. Durant has participated in a few practices, has been going through increasingly active pregame workouts, and it seems pretty clear that his teammates believe things are looking good for a Durant return. As everybody remembers, the Warriors went 2-5 immediately after Durant’s injury (counting the game in which he suffered the injury), and alarm bells rang throughout the NBA universe. But after that rough schedule stretch, the Warriors have regrouped, reclaimed their fierce defensive identity, redistributed some of Steve Kerr’s rotations and rumbled through a relatively soft part of their slate. They look like the best team in the world again, just in time for the playoffs, and yes, I’m sure all of their rivals have noticed this. All without Durant. Who is coming back Saturday. Of course, the Warriors want and need him back, because he’s Kevin Durant and he can do things almost nobody else in NBA history has done – and specific things the Warriors need in the playoffs. But it’s also safe to say that losing Durant forced the Warriors to address some issues and reset their season just in time for this mad rush to May and June. Andre Iguodala shifted into a slightly different and larger role. So did Shaun Livingston, David West, Matt Barnes and Ian Clark. Curry, Draymond Green and Klay Thompson got new energy and rhythm. And all of them will be that much better and are in that kind of a groove for when Durant comes back. No, no, no, the Warriors aren’t better without Durant – but they got better without him because they had to, and when he comes back they be quantum leaps even better still. Does he have to make major adjustments to fit in with the new Warriors cohesion? No, Durant is one of the most talented and smartest players in NBA history, his teammates know it, and he will figure out how to do this. Plus: They were 50-9 when he got hurt, anyway. 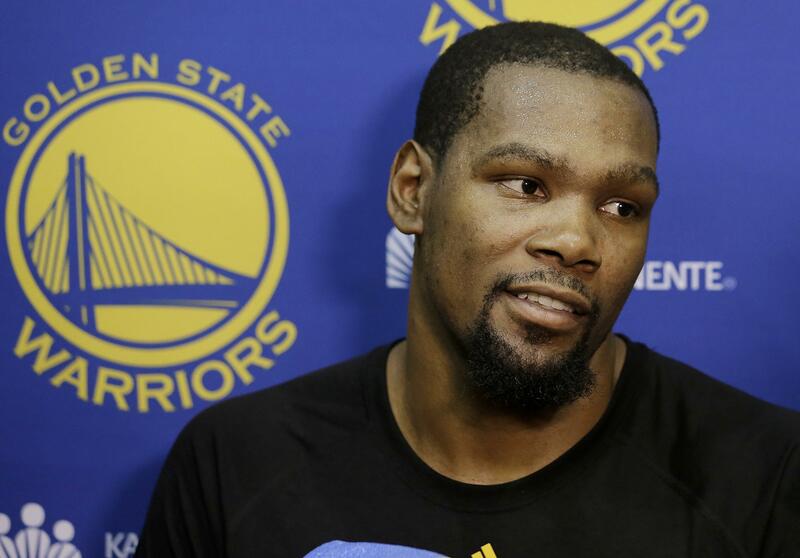 “There’s no blending in for KD – he’s going to be himself,” Curry said. “We just figured out an identity of how we’re going to play, especially defensively. Are Curry, Green, Thompson and the other high-profile Warriors telling Durant anything as he heads into his return? Kerr will put Durant back in the starting lineup as soon as he’s ready to go, but obviously the minutes will be limited and how Durant’s knee responds to the activity will determine things from there. Counting Saturday vs. New Orleans, the Warriors will have three regular-season games left, and then the first round of the playoffs, which presumably will not be the hardiest competition for them. So they can work Durant in over five or six games, and basically, the reality is this: Winning streak or not, if you’re subbing in Durant for Patrick McCaw or Barnes, that’s probably going to be a major plus. “The whole thing is his health and conditioning,” Kerr said of Durant. “We want to get him back playing at a high level, we know it’s not going to happen in two or three regular-season games. It’s going to take a few playoff games, as well. “We’re playing really well, but in my opinion, if Kevin had been here the last 12 games, we would’ve won the last 12. This has nothing to do with his absence; this has to do with the schedule. They’re just winning. Their defense is at a higher level. They’re getting Durant back soon. Things are so bright and sunny for the Warriors now, they can’t help but be in a good mood – and hit a multitude of 3-pointers, apparently. “I’d probably say the weather’s gotten better,” Thompson said after making 7 of 14 3-point tries on Tuesday, on his way to an easy 41 points. “The sunshine has been so good to me. It just puts me in a great mood to be able to go to the gym every day, get my work in, go home, enjoy the outdoors. By the way, Thompson’s 3-point deluge on Tuesday raised his season total to 262, second most (to Curry) in the NBA this season. Last season, Thompson made 276, which is fourth all time behind three Curry seasons. So, when or if Thompson makes eight more 3-pointers this season to pass Ray Allen’s 269 total in 2005-2006, Curry and Thompson will hold the top six all-time spots in this category. Things are going well. The Warriors are back in stride. They faced a moment of crisis, they dealt with it, they got better because of it. And now Durant’s coming back, which is an interesting new plot twist to a season that is building toward an epic final few chapters. Published: April 7, 2017, 6:46 p.m. Updated: April 7, 2017, 11:06 p.m.